The Syracuse Youth Orchestra (SYO) and Syracuse Youth String Orchestra (SYSO) will present a concert on Sunday, April 13, at 4:30 p.m. in the West Genesee High School auditorium, 5201 W. Genesee St., Camillus. Tickets for the concert are $10 for adults and $5 for patrons age 18 and younger. Tickets may be purchased at the door. The SYO will perform works by Tchaikovsky, Beriot, Mendelssohn and Borodin. 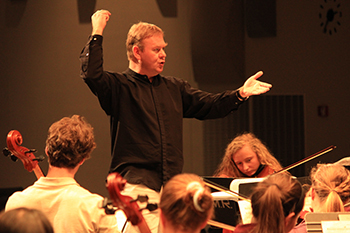 The SYSO’s program will include works by Biber, Piazolla and Sibelius. During intermission, the orchestras will hold a recognition ceremony to honor members who are seniors. The Syracuse Youth Orchestras are part of the Community Music Division of the Rose, Jules R. and Stanford S. Setnor School of Music in Syracuse University’s College of Visual and Performing Arts. The SYO is conducted by James R. Tapia, and the SYSO is conducted by Karen Veverka. The Syracuse Youth Orchestras consist of middle and high school student musicians from Central New York. Playing in these ensembles helps students grow musically and intellectually and learn discipline and teamwork that will benefit them throughout life. For more information, contact Kim Rossi at Syracuseyouthorchestras@gmail.com.